Kids who eat healthy do well at school, maintain a healthy body weight, and have stronger immune systems. And children who learn the importance and pleasure of eating healthy early on develop behaviors that can last far beyond their daycare years. But knowing that kids need to eat healthy and getting them to do it are two very different and challenging things. Here are a few fun and creative tips that encourage kids to gobble up their fruits, veggies and whole grains, making parents happy and kids healthy. Early on, parents realize the power of choice when it comes to establishing healthy habits. For instance, allowing the child to pick out their own toothbrush motivates them to keep their teeth clean. The same is true when it comes to eating. Involve your child in the planning of meals by allowing him or her to select the dinner menu on the night of their choice. Make a list of the ingredients, shop together and then prepare the meal as a team. Another great way to support healthy eating habits in kids is to take them shopping with you. Allow each child to pick out one or two fruits and vegetables that they want to eat. Encourage them to try new items, like butternut squash, avocados, pomelos or jicama. Plus, allowing children to see food in its raw and natural state, as opposed to coming from a box or package, connects the child to the food they are eating. Just as enjoyable as it is to share a delicious meal with others, it is equally enjoyable to prepare a meal together. 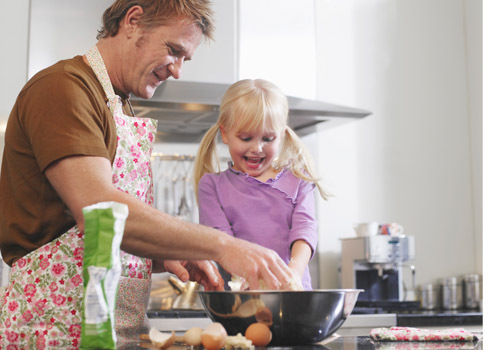 And kids love to be where the action is… so near dinnertime, involve the young ones in the kitchen. For instance, toddlers can help tear the ends off of green beans while older children can assist in peeling potatoes or measuring out brown rice. By giving them age-appropriate tasks, not only will they relish their new culinary responsibilities, but they are also more apt to delight in the yummy creations of their hard efforts and experiment with different foods.